Five days after Amara got out of school for summer vacation she had oral surgery and had 11 teeth extracted. Eleven! Extracted sounds so much better than pulled! Her dentist was very concerned that her baby teeth just weren’t coming out fast enough and her permanent teeth were trying to come through and were looking for a place to go! Amara came through it all like a champ and her dentist certainly seems to have been right as you could see new teeth in her gums that very same day. Now they are coming up like crazy! 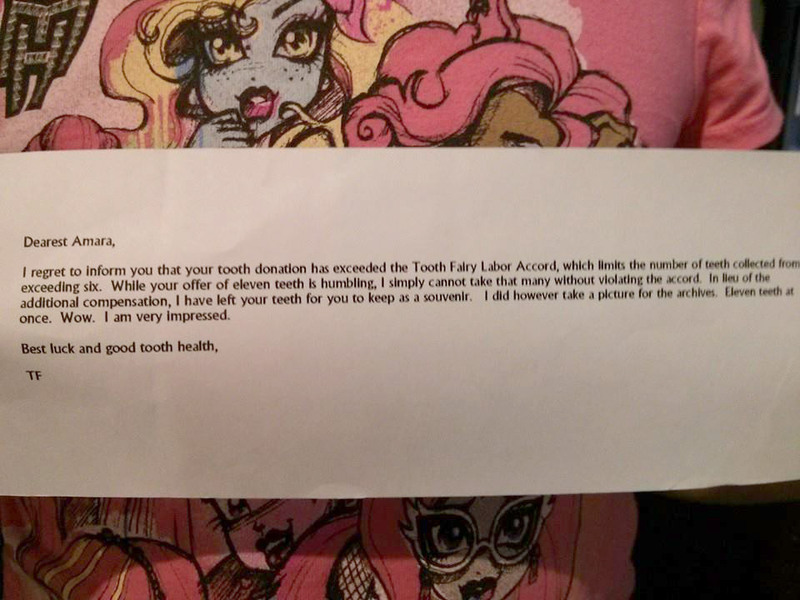 But the best part of this story is the amazing personal letter that Amara got from the Tooth Fairy. In the past the Tooth Fairy has always brought Amara $5 for a tooth but she had no idea what he might bring her for all of these. The next morning she awoke to find the teeth, $30 and the following letter under her pillow. I regret to inform you that your tooth donation has exceeded the Tooth Fairy Labor Accord, which limits the number of teeth collected from exceeding six. While your offer of eleven teeth is humbling, I simply cannot take that many without violating the accord. In lieu of the additional compensation, I have left your teeth for you to keep as a souvenir. I did however take a picture for the archives. Eleven teeth at once. Wow. I am very impressed. Best letter ever from the Tooth Fairy! This memory was posted in Special Occasions and tagged Amara, Tooth Fairy on July 8, 2014 by Grandma Kc. What a great letter! I can understand the need for a Tooth Fairy Labor Accord, however!!! Hope Amara has bounced back and will be ready for Corn on the Cob season. She is doing great Maggie and actually did have some corn on the cob yesterday! Thanks Launna! She has told everyone about that letter and I wouldn’t be surprised if it didn’t go back to school with her next year! She has a very good Tooth Fairy! Oh my, I love this post. I’m so glad she is doing well after her surgery and that she’ll have all summer to give those new teeth time to arrive. And, please extend a ‘high five’ to the CA TF who left that note. Best note ever!! She is really doing great. Us grownups would have been dying from it! The first few days her speech was a bit off, as if there was too much room in there for her tongue! Now you would never know but her smile looks more relaxed somehow. There will be pictures soon! High fives have been delivered! That is so sweet. Eleven teeth extracted at once…WOW. She is a trooper! It is crazy how she just breezed through it. She spent the first day lounging on her parents’ bed but Jenna said she took Tylenol once! That is so cool! Gotta give The Tooth Fairy a hand! Poor Amara’s mouth, though. Geez… I cannot even imagine having that many teeth pulled. Kudos to her for being a trooper. Somehow it doesn’t surprise me at all that he is loosening teeth! You have to let me know how he felt about the Tooth Fairy Labor Accord – it may just be a California thing. I’m not sure! Wow! This is the second time this year I have read about children having massive numbers of teeth pulled at once. (The other account was here: http://1morningglory.blogspot.com/2014/02/ten-teeth-of-thankfulness.html). I’m glad everything went well. That note from the tooth fairy is priceless! WOW!!! I went and read the other post and Amara certainly didn’t have as many problems as that poor young boy! Interesting that they are both 10 and they both lost 11 teeth! He looks like he has a long road in front of him – hope it all turns out well. Wow-that is a lot of teeth extracted. What a great note from the Tooth Fairy. Hope Amara is doing good and spending her money wisely. Her Mom laughed at your comment! Amara is funny, if she has something specific in mind that she wants she is very frugal but if not and there is anything My Little Pony or Minecraft for sale at Target – the money is gone! She really is doing great! Yep! There is nothing cuter than that picture of the first lost tooth but it is the beginning of growing up! If she won’t be embarrassed can we see some pictures of that beautiful Amara smile sans teeth? Another great post! I promise there will be new pictures soon! Now I may be just a little prejudice but I think her smile looks even better now! Both my sister and I had baby teeth coming through the gum ( eye tooth / one each ) and back then they pulled or took THAT out and left the baby tooth. I also always heard that a Great-Uncle or Grand-Uncle had retained his baby teeth for all of his life and never got the adult ones in! How weird would that be if you kept your baby teeth? They say they aren’t intended to last as long so they are softer – wonder if he ever noticed? What a smart tooth fairy! I love that she ‘took a picture for the archives’ — too too funny! My son had one baby tooth that was hindering the adult tooth coming in…. but ELEVEN, oh my! Hope Amara got to eat lots of ice cream! She does have a wonderful Tooth Fairy! Amara is not a huge ice cream fan but there has been a bit – there’s been lots of yogurt! But that really only lasted a day or two and she was back to eating most everything! Kids bounce back better! Hmmmm. I am tempted to say here that the TF is making things up as he flies along. I have never heard of a limit on tooth redemption! I think he owes Amara $25. And maybe even punitive damages! Don’t you know by now that California has laws governing everything including Tooth Fairies? Michigan may not have just laws! The poor baby, 11 teeth extracted. She is a trooper. I love the letter, $5.00 a tooth is pretty pricey. I understand why the Tooth Fairy set a limit, lol. I hope she recovers quickly. Great post. She has recovered so quickly it is almost annoying! But we are also all thrilled! I’m not sure what Tooth Fairies in other areas are paying but in talking to other students and parents at Amara’s school this seems to be typical for our area. Sure more than I ever got! Oh my. That is a lot of teeth. Isn’t it strange how differently kidlets lose teeth. Hope the new teeth continue to pop right on up where they need to be. So happy Amara came through the ordeal without any problems! That’s a lot of teeth to loose. Just for the record, I think the TF should have paid for all 11 teeth. If she would have lost them one at a time, she would have collected on all of them. Hmmmm … darned CA laws!! Kendie just lost another tooth – the Virginia TF left her $2. Maybe .25 wasn’t so bad after all. There have been a couple of others who felt Amara should have gotten full payment but California does have stricter laws!